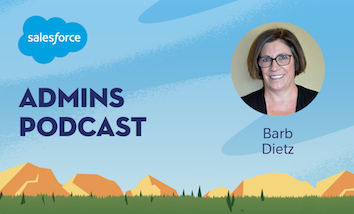 Today on the Salesforce Admins Podcast we have the last episode in our review of great episodes of the past year, focused on connections. As admins, we need to connect a lot of things: our company with our customers; our business units across the company; and our community to grow the Salesforce Ohana. 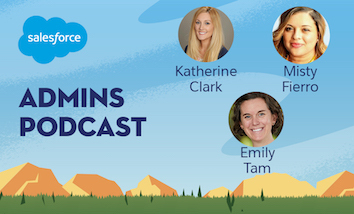 We revisit interviews with Katherine Clark, Vetforce Product Manager at Salesforce; Misty Fierro, Senior Salesforce Analyst in Sales Operations and Commercial Analytics at SolarWinds; and Emily Tam, Director of Application Development at Borrego Solar Systems. 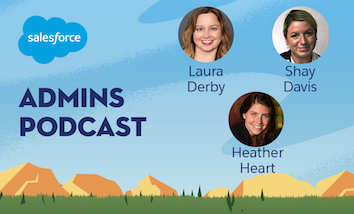 Join us as we talk about how Katherine, Misty, and Emily create connections: connecting customers with what they need, connecting community members with each other, and connecting business units. You should subscribe for the full episode, but here are a few takeaways from our conversation with Katherine, Misty, and Emily. 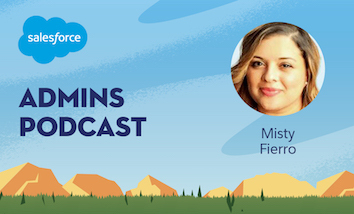 How automation helps Katherine be a solo admin at Salesforce. Katherine Clark is the Vetforce Product Manager at Salesforce, and that community of veterans is understandably focused on a goal-oriented approach to learning the platform. A key to serving that audience is setting up the community to help them achieve those goals. “What really helps our community thrive is harnessing the automation that Salesforce provides,” Katherine says, “because of our integrations we’re able to pull in information and other places to automate the delivery of our benefits.” So if they see that someone earns a specific number of badges, they can use automation to place them in the Ranger group in Vetforce. Vetforce is a big community, there’s only one Katherine to manage the whole thing. “I like to tell people I’m a solo admin at Salesforce and it blows people’s minds,” she says, “there’s nobody at the desk next to me to turn to and ask a Salesforce admin question, so I use Cases, I use Knowledge, anything that helps me connect with our members and automate and streamline as much as possible. I just try to pull in as many innovative solutions as I can so that our members can get connected to those Salesforce skills and careers as quickly as possible.” Pulling in a component is such a powerful tool to give members exactly what they need at exactly the right time. Helping a nonprofit and connecting veterans. Misty Fiero is the only person to get Gillian up before a community event to work out in the morning. In other words, she’s an amazing connector, not only with other people but in the way she connects others with Salesforce skills and opportunities. The first person she needed to connect to start her Salesforce journey, however, was herself. On the weekends, Misty helps run two dog rescues: Justice4Mutts, and Texas Trailblazers. “We get a lot of stuff done with a little bit of resources,” she says. Around the time Misty was attending the first Dreamforce, she had identified a problem with communication in her nonprofit. At the event, she learned that Salesforce will provide a nonprofit instance to 501(c)3’s. Building out that instance helped Misty get the experience she was looking for, but she also needed some help. Through Vetforce and Merivis she was able to work with other veterans to get everything accomplished, and she continues to partner with those groups to both maintain the instance and get people experience. Using Salesforce to connect every part of the business. Emily Tam has been in the Salesforce ecosystem for a long time. She needs to worry about connections every day because her team is distributed. While she’s based in the Oakland, a large part of her team is based in Massachusetts and people work remotely all the time. They’ve swapped to an Agile methodology, and the Agile Accelerator app has been a big help. “With the Agile Accelerator we’re able to have that close-knit feeling of a team that’s colocated without being in the same location,” Emily says. Emily also uses Salesforce to connect every part of her business— everything from managing HR to check requests to building solar panels. Her team built a requisitions request form on the platform, so anytime you need approval for something, whether that’s purchasing, legal, or technical, you use the same centralized tool to make the request. “Managers love it because it’s at the top of their queue, they log in every day and they see what they have to approve; and employees like it because it’s one central place for them to go,” she says.